The usual way of hiding or unhiding files is by going to File Menu> Tools> Folder Options> View> uncheck or check the settings show hidden files and folders. Well, this is little bit time consuming. 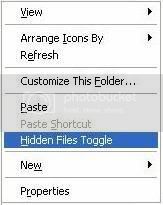 To make things easier there’s a small extension- Hidden Files toggle which adds the option to the right click menu. It appears on the Desktop and folder backgrounds. The option gives you the ability to toggle the display of hidden files on and off. It’s pretty useful if you frequently change this setting. And moreover most of us find it more convenient to do it by right clicking instead of navigating through the options menus in Windows Explorer. Download the installer from below. Run the installer and follow the simple on-screen directions.